A method of recording multimodality monitoring signals in patients with severe brain injuries using a bedside, single burr hole technique is described. Foreman, B., Cass, D., Forbes, J., Ngwenya, L. B. A Bedside, Single Burr Hole Approach to Multimodality Monitoring in Severe Brain Injury. J. Vis. Exp. (145), e58993, doi:10.3791/58993 (2019). Intracranial pressure (ICP) monitoring is a cornerstone of the intensive care management of patients with severe acute brain injuries, including traumatic brain injury. While elevations in ICP are common, data regarding the measurement and treatment of these ICP elevations are conflicting. There is increasing recognition that changes in the balance between supply and demand of brain tissue are critically important and therefore the measurement of multiple modalities is required. Approaches are not standard, and therefore this article provides a description of a bedside, single burr hole approach to multimodality monitoring that allows the passage of probes designed to measure not only ICP but brain tissue oxygen, blood flow, and intracranial electroencephalography. Patient selection criteria, operative procedures, and practical considerations for securing probes during critical care are described. This method is readily performed, safe, secure, and flexible for the adoption of a variety of multimodality monitoring approaches aimed at detecting or preventing secondary brain injuries. Severe brain injuries such as traumatic brain injury (TBI) or subarachnoid hemorrhage may result in coma, a clinical state in which patients do not respond to their environment. Neurosurgeons and neurointensivists rely heavily on the clinical neurological exam, but severe brain injuries may make it impossible to detect changes related to the brain's physiologic environment: elevations in intracranial pressure (ICP), decreases in cerebral blood flow, or nonconvulsive seizures and spreading depolarizations. These physiologic disturbances can lead to further injury, termed secondary brain injury. After severe traumatic brain injury, elevations in ICP are common and may result in decreased blood flow and therefore secondary brain injury and neurodeterioration. Elevations in ICP have been documented in up to 89% of patients1 and neurodeterioration occurs in one-quarter, increasing mortality from 9.6% to 56.4%2. Therefore, the measurement of ICP is the most commonly used biomarker for the development of secondary brain injury and has a Level IIb recommendation from the Brain Trauma Foundation3. The measurement of ICP was pioneered over 50 years ago4 using catheters that were introduced through a twist drill craniostomy (often referred to interchangeably as a burr hole) typically created in the frontal bone at the mid-pupillary line just anterior to the coronal suture and passed into the ventricles. However, these external ventricular drainage catheters (EVDs) require midline anatomy, which is not always present after severe brain injuries, and misplacement can potentially damage deep structures such as the thalamus. Although EVDs allow drainage of CSF as a potential treatment option, the hemorrhage rates from EVDs are 6–7% on average5,6. Intraparenchymal pressure monitors are introduced via burr hole and are common alternatives and adjuncts to EVDs with hemorrhage rates of 3–5%7,8. These are smaller probes that sit 2–3 cm under the inner table of the skull, and allow for continuous measurement of pressure but without an option to drain cerebrospinal fluid, as do EVDs. Existing cohort studies9 and meta-analyses10,11 suggest that targeting ICP as a marker of secondary brain injury may improve survival; however, a randomized controlled trial comparing treatment of ICP based on neurological exam alone vs. measured ICP failed to demonstrate benefit12. Advances in neurosurgery and neurointensive care have led to an understanding that brain physiology is more complicated than ICP alone. It has been demonstrated that autoregulatory function within the brain is impaired after brain injury13, leading to changes in the regulation of regional cerebral blood flow (rCBF). Further, the burden of nonconvulsive seizures14 and spreading depolarizations15 are being recognized using recordings from intracranial electroencephalography (iEEG) electrodes. Strategies to improve brain tissue oxygen (PbtO2) were shown to be a target for therapy and proved feasible in a large, multicenter Phase II clinical trial16. This article describes a technique that allows for the simultaneous measurement of multiple modalities — including ICP, PbtO2, rCBF, and iEEG — using a simple, single burr hole placed at the bedside in patients with severe acute brain injuries requiring intensive care. Patient selection and surgical approach to this technique are included. This technique specifically allows for the placement of multiple probes to provide targeted monitoring of multiple physiologic parameters that may provide a more sensitive and specific early warning system for secondary brain injuries. This protocol was developed as a standard of care. The retrospective use of data gathered during the course of care was approved through a waiver of informed consent by the University of Cincinnati’s Institutional Review Board. Identify patient with acute brain injury (traumatic brain injury, stroke). NOTE: Collaborative discussion between surgical and intensive care teams is critical to ensure that there is consensus on which acute brain injury processes warrant monitoring. Rule out confounders that may cloud clinical examination including elevated alcohol level or toxic exposures. Rule out contraindications to neurosurgical procedures, including but not limited to platelets <100 g/dL, international normalized ratio >1.5, recent administration of non-vitamin K antagonist anticoagulants; caution is warranted in those on dual antiplatelets (e.g., both aspirin and clopidogrel). Perform Glasgow Coma Scale score. Patients are excluded if they exhibit command following or if they cannot follow commands due to aphasia and have eye opening spontaneously or to voice. Once a patient is considered eligible for advanced neuromonitoring, obtain operative consent after discussion of risks and benefits of the procedure. NOTE: Risks include an overall risk of significant hemorrhage 1.9% and a theoretical risk of infection. Benefits include ability to monitor intracranial parameters for targeted therapies, although there is no class I evidence for the use of any intracranial monitoring modality. Identify the correct location for placement of the bolt. This will be 11 cm from the nasion or 1 cm anterior to the coronal suture and 2–3 cm laterally at about the mid-pupillary line. Clip hair in the region of the scalp through which the bolt will be placed as identified in step 2.1. Then re-identify the correct location once more and mark with a pen or a marker. Immobilize the head by using tape or other securing strategy to ensure that the head does not move during the burr hole placement. Sterilize the area using betadine solution, allowing the prepared area to dry fully. NOTE: Commercial chlorhexidine solutions may contain indications that they are not for use when in contact with cerebrospinal fluid due to neurotoxicity. Using 10 cc of 1% lidocaine with epinephrine, provide adequate analgesia to the location marked in step 2.2. Begin with the skin, creating a large wheal, then advance the needle to the periosteal surface and inject several cc as the needle is retracted slowly to the surface of the skin. Set up a sterile table with the following equipment. Prepare a cranial access kit or comparable set of instruments that include a scalpel blade, hemostat, forceps, gauze, and a hand-held twist drill. Open intracranial monitors onto the sterile field (Table 1 and Table of Materials), including (i) quad lumen bolt kit and locking nuts (up to 4); this kit will also include a 5.3 mm cranial drill bit to be used with the hand-held twist drill (step 3.1.1); (ii) the ICP/PbtO2 probe; (iii) the rCBF probe; (iv) the depth electrode with stylet; (v) optionally (not shown), 70 microdialysis bolt catheter or other intracranial probe. Thread each probe through a locking nut and subsequent insert through one of the lumens of the bolt. The ICP/PbtO2 probe, the thickest probe, is placed preferentially in the tallest lumen, whereas the other probes can fit through any remaining lumens. Measure the distance from the end of the bolt to the tip of each probe at 2.5–3 cm. Advance the depth electrode until the most proximal electrode is just outside the end of the bolt. Once the probe is placed the appropriate distance from the end of the bolt, tighten the locking nut on the lumen of the bolt and then the probe itself, locking in place on the probe. Once the locking nut is tight, loosen the nut from the lumen and remove each probe with its locking nut in place. Place on the sterile table next to the bolt. Use scalpel to create a 1–2 cm incision in the anesthetized region (step 2.5). Use blunt tip instrument to separate subgaleal tissues, exposing periosteum. Insert and use hex bit to tighten 5.3 mm drill bit to the cranial drill. Place the cranial drill perpendicular to the skull. Use continuous pressure while rotating the drill. Continue to drill until there is a tactile change in pressure. Once it becomes harder to drill, the inner table of the skull has been reached. Continue drilling with counter upward support to avoid plunging the drill into the cortex. Remove the drill and clear the burr hole of any bone chips or debris using a curet or hemostat. Use a scalpel blade to incise the dura in a cruciate fashion. Confirm that the dura is completely open. NOTE: Some practitioners may use alternative approaches, such as using an 18 G needle to perforate the dura using tactile feedback until the dura is sufficiently opened. Adequate durotomy is critical regardless of the technique, and incomplete durotomy may lead to difficulty passing thin, flexible catheters or malpositioning of the catheters. Holding the bolt by the plastic wings, thread through the burr hole using a firm, clockwise twisting motion. Be careful not to overtighten, which can compress the adjacent skin and soft tissues. NOTE: Cerebrospinal fluid may rise from the lumens of the bolt, particularly if there is increased intracranial pressure. Insert each pre-measured probe until the locking nut meets the lumen. The dura may provide resistance, particularly to thinner probes. Insert the thinnest probe first, which may help avoid pass resistance. Insert the depth electrode with the stylet in place. Once placed and tightened on the lumen, gently loosen the locking nut from the probe just enough to remove the stylet, then re-tighten. NOTE: Once all probes are locked onto the lumens through which they pass, the sterile part of the procedure is complete. Have available personnel connect the ICP/PbtO2 probe to the bedside monitor to assess the intracranial pressure and brain tissue oxygen. Using silk or other durable tape, gently loop each probe and tape it to its lumen. This creates strain resistance. Use caution not to create a “kink” in the probes, as they have thin components that can break. Optionally, use a large 6” x 2” tegaderm or a thin strip of occlusive petrolatum gauze to wrap the base of the bolt, reducing the exposure of the skin-to-burr-hole interface. The occlusive petrolatum gauze also provides bacteriostatic function. Prior to transport, use a woven gauze to wrap the entire bolt, encompassing each of the unplugged probes within the roll, and tape the end with silk tape. This ensures that the loose ends of unplugged probes are not accidentally pulled during movement to and from operative or radiological beds. Once an initial ICP is recorded, if it is clinically appropriate, order a noncontrast head computed tomography (CT) to verify the position of the bolt and the probes, which should sit within the frontal subcortical white matter. This will also expose any adverse events such as subdural or intraparenchymal hemorrhage that rarely occur during placement. For intracranial pressure, verify that a pulsatile waveform is present. The ICP data measured by the ICP/PbtO2 probe generates a waveform visible on the local recording system. For brain tissue oxygen, first examine the temperature of the brain and verify that the temperature is similar to what would be expected for core body temperature measured at another site (bladder, esophageal). Second, verify the responsiveness of the monitor by transiently increasing the fraction of inspired oxygen (FiO2) of the patient to 1.0 (100%). NOTE: Within 15 min, the PbtO2 should increase by at least 10 mmHg. If not, the diffusion of dissolved oxygen is being impeded either by a small hematoma (check CT scan from step 7.1) or local microtrauma induced by placement of the probe itself. Consider loosening the locking nut slightly and turning the probe clockwise 90° and re-tightening the locking nut in case there is a small amount of clotted blood accumulated on the oxygen entry surface of the probe. For cerebral blood flow, first wait for the initial measurement, which may take up to 6 min for the probe to establish a stable thermal field. Ensure that the blood flow probe temperature is within 0.7 °C of the brain tissue temperature. NOTE: If lower, the blood flow probe is likely too shallow and will need to be advanced. Ensure that the probe placement assistant (PPA) number, which is simultaneously generated with blood flow probe temperature in 7.2.3.1, reads <2. NOTE: This measurement is performed by a mechanical probe which senses displacement of the probe related to pulsatility, and values range from 0.0 (stable thermal field) to 10.0 (nearby pulsatile blood vessel render the thermal field too unstable to generate rCBF). If the PPA is >2, consider pulling the probe back by 0.25–0.5 cm. For depth electroencephalography (EEG), visually inspect the signal. NOTE: The depth electrodes require a ground electrode and reference electrode. A local electrodiagnostic technologist will be able to assist in placing these electrodes. Correctly recorded EEG should demonstrate a mixture of frequencies at a 15 µV/mm scale with a dynamic range ± 200–400 µV at a high-pass filter of 0.5 Hz and a low-pass filter of 50 Hz. If this is not seen, it may be worth verifying the placement of the reference or the ground. NOTE: Following the procedure, no further pain control is necessary and no prophylactic antibiotics are required. At the end of the clinical monitoring period, remove the bolt by first removing each of the probes individually. Then, twist the bolt counterclockwise until it comes loose from the skull and can be removed. Use sterile technique to suture the skin opening and monitor for any cerebrospinal fluid leakage, bleeding, or swelling at the site. Experience in using this approach in 43 patients with severe TBI was recently published17. Patient selection limits the number of those eligible, but focusing on only those with TBI at a level I trauma center led to approximately 2 patients per month. This number is predicated on hospital volume and may increase if additional acute brain injuries are considered for monitoring, such as those with hemorrhagic stroke. Placement may take place either in patients with non-surgical severe injuries or in those who have undergone surgery, depending on the preferences at an individual institution (Figure 1). This technique has been performed within a median of 12.5 h (interquartile range [IQR] 9.0–21.4 h) of injury and probes have been left in situ for a median of 97.1 h (IQR 46.9–124.6 h)17. Placement is typically within the non-dominant frontal lobe unless there is a contraindication. Three-quarters of bolts placed in dominant frontal lobe were placed contralateral to prior craniectomy. Nonetheless, in TBI, this strategy led to placement within an injured lobe the majority of the time. Misplacement was rare using this technique, occurring in only 6/42 (14.3%) of patients; device measurements were rarely affected17. Bedside placement resulted in no adverse events at the time of bolt insertion. On follow up CT, small regions of peri-probe hematoma, pneumocephalus, or bone chips were found in 40.5% of patients17. However, mirroring the experience of other institutions18 that perform similar monitoring, only one expanding hematoma was considered to be a major hemorrhage. In this case, no surgical or medical intervention was recommended, and the patient outcome was felt not to be impacted. Across two cohorts including patients with TBI and subarachnoid hemorrhage, the overall rate of significant hemorrhage is 1.9%17,18. Once devices are in place, device dislodgement may occur and has been described as being related to the size of the probes, length of time they remain in situ, and relative complexity of moving, transferring, and caring for this patient population. More than half of patients experienced dislodgement of at least one probe before the end of their recording period, mostly commonly the rCBF probe. Limiting transportation may mitigate this risk: the number of trips that patients took appeared to be associated with devices becoming dislodged or no longer functioning (Wilcoxon rank sum test, p = 0.03)17. Nonetheless, this technique has resulted in measurements of all modalities in more than 90% of placements and most probes remain in place and generate continuous data for >90% of the recording period. Figure 1: Clinical and radiologic placement of multimodality monitoring probes. (A) Appearance of bolt with three probes, as labelled prior to securing the probes or wrapping for transport. (B) Scout CT images (coronal and sagittal, respectively) demonstrating the trajectory of the probes approximately 1.5 cm (Depth) and 2-3 cm (ICP/PbtO2, rCBF) below the inner table of the skull. (C) Axial CT after non-surgical severe TBI with excellent placement. Notice with standard windowing that the relatively dense probes may obscure subtle peri-probe hematoma. (D) Axial CT after surgical severe TBI demonstrating the placement of the bolt and probes contralateral to the hemicraniectomy site. (E) Incorrect (deep) placement of the probes after non-surgical severe TBI. Note that the probes are approaching the frontal horn of the lateral ventricle, indicating they are >3 cm below the inner table of the skull. This placement may affect measurements obtained by the probes, although shallow, rather than deep, placement is more liable to create problems with rCBF and PbtO2 measurements. Please click here to view a larger version of this figure. Table 1: Intracranial probes. The names of the probes used in this article and their measurements and sampling resolution. Please note that this is a representative list of probes that may be used for multimodality monitoring but does not represent an exhaustive list of the potential modalities that may be commercially available. EEG = electroencephalography; ICP = intracranial pressure; ICT = intracranial temperature; PbtO2 = brain tissue oxygen; rCBF = regional cerebral blood flow. This article provides the practical elements of a method for introducing multiple probes into the brain follow acute brain injury in order to facilitate a multimodal approach to understanding the physiology underlying secondary brain injury. The existing Brain Trauma Foundation guidelines suggest the use of intracranial pressure monitoring in specific patients after trauma (Level IIb)3, although there is evidence to suggest that this is variably practiced even at high-volume level I trauma centers19,20. This may be in part due to the differences between techniques (ventricular drainage vs. parenchymal probes), anatomy (the presence of midline shift or slit-like ventricles), and practitioner preference. In any case, evidence is mounting that the measurement of ICP alone may be inadequate for the detection and mitigation of secondary brain injuries. The insertion of multiple probes through a bolt provides a reliable way to monitor patients for the length of time required for critical care, and while dislodgement or discontinuation occurred frequently, this was in part related to patient transportation. After initial experience, additional safeguards included in the current protocol were implemented, such as strain relief measures. By way of contrast, tunneled probes may be more susceptible to traction and dislodgement because the length of the probes does not allow for the subgaleal fixation used to keep EVDs in situ. Some have argued that tunneled probes may be beneficial and can be adequately secured in order to avoid magnetic resonance imaging (MRI) incompatibility and artifacts, but many probes are not MRI compatible regardless of fixation21. Importantly, the use of multimodality monitoring is designed to provide time-resolute data during the acute period in which many patients are unstable to travel to MRI. Patients described here underwent monitoring within a median of 12.5 h and were monitored for a median of 4 days after trauma, which allowed for advanced imaging within a reasonable time frame. 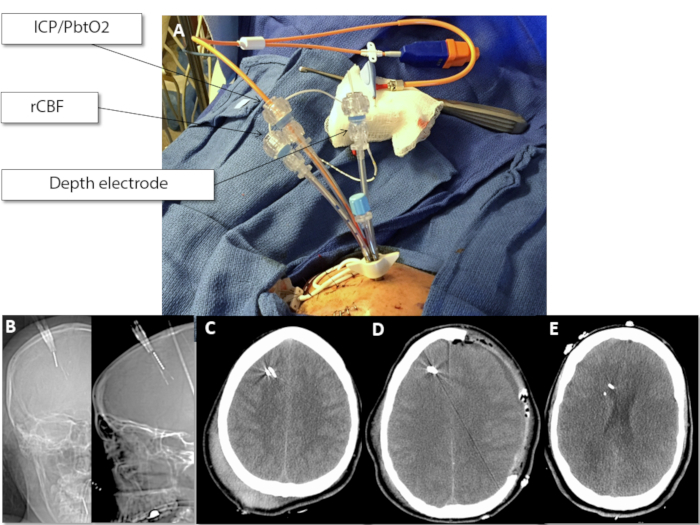 The use of a single cranial access point reduces procedural risk, and strict patient entry criteria limits the potential for medication- or coagulopathy-related complications. The rates of minor hemorrhage reported here were in line with the documented incidence of peri-probe hemorrhages in the EVD literature22,23, although these are not uniformly reported. The rates of significant hemorrhage using the method described here are lower than those reported in the EVD literature and only slightly higher than the rates of significant hemorrhage associated with single intraparenchymal monitors. In addition to a relatively low overall operative risk, the use of a single, standardized burr hole is a bedside procedure, which allows this technique to be carried out in critically ill patients too unstable to move to an operative suite and by practitioners with bedside procedural privileges, such as neurosurgery house staff or neurointensivists. There are several limitations that arise using a single burr hole placed at Kocher's point for neuromonitoring. First, the size of the burr hole and the use of a bolt preclude the placement of additional monitors, such as strip electrodes used as the gold standard for the detection of spreading depolarizations according to recommendation from the co-operative studies on brain injury depolarizations (COSBID) collaborative24. Second, the spatial resolution of intraparenchymal monitoring may not be adequate to detect the signatures of secondary brain injury that occur remote from the probes. While the majority of the time monitors were placed near injured cortex, this approach is limited to frontal lobe monitoring, which may miss lesion development or evolution, for instance, in temporal or parietal cortex. Although this approach does not provide a global assessment of brain tissue, the ability to continuously monitor a vulnerable brain region provides the advantage of real-time patient care decision making. The method presented here is flexible in allowing for multiple probes based on the equipment available to local sites. For instance, probes that measure microdialysis may be added to the fourth port available via the bolt without substantially modifying the existing protocol. Similarly, probes may be excluded if necessary. In conclusion, a technique for multimodal monitoring after acute brain injury using a single bedside burr hole is described. This technique is flexible, provides reliable, clinically-actionable data that can be used by neurosurgeons and neurointensivists at the bedside within hours of injury. 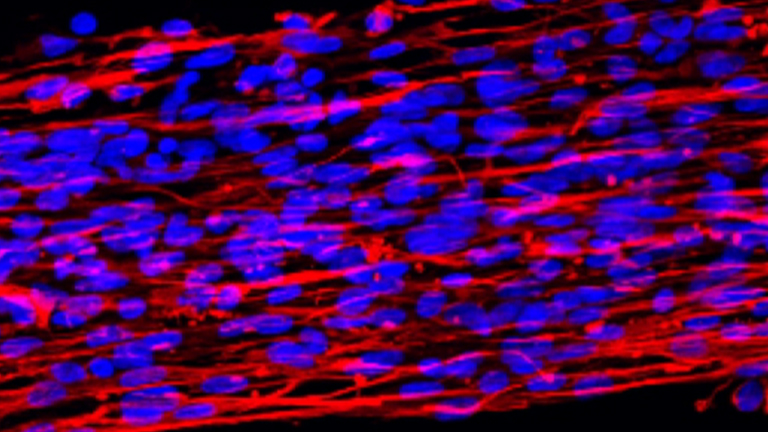 This work was supported in part by the National Institute of Neurological Disorders and Stroke of the National Institutes of Health under Award Number K23NS101123 (BF). The content is solely the responsibility of the authors and does not necessarily represent the official views of the National Institutes of Health (NIH/NINDS). The authors wish to acknowledge the leadership of Dr. Norberto Andaluz (University of Louisville) for his role in spearheading this technique. We also wish to acknowledge the hard work of the neurosurgical residents who refined the technique and the neurocritical care nursing staff who have embraced this new technique for the benefit of their patients. Jones, P. A., et al. Measuring the burden of secondary insults in head-injured patients during intensive care. Journal of Neurosurgical Anesthesiology. 6, (1), 4-14 (1994). Juul, N., Morris, G. F., Marshall, S. B., Marshall, L. F. Intracranial hypertension and cerebral perfusion pressure: influence on neurological deterioration and outcome in severe head injury. The Executive Committee of the International Selfotel Trial. Journal of Neurosurgery. 92, (1), 1-6 (2000). Carney, N., et al. Guidelines for the Management of Severe Traumatic Brain Injury, Fourth Edition. Neurosurgery. 80, (1), 6-15 (2017). Hawthorne, C., Piper, I. Monitoring of intracranial pressure in patients with traumatic brain injury. Frontiers in Neurology. 5, 121 (2014). Binz, D. D., Toussaint, L. G., Friedman, J. A. Hemorrhagic complications of ventriculostomy placement: a meta-analysis. Neurocritical Care. 10, (2), 253-256 (2009). Bauer, D. F., Razdan, S. N., Bartolucci, A. A., Markert, J. M. Meta-analysis of hemorrhagic complications from ventriculostomy placement by neurosurgeons. Neurosurgery. 69, (2), 255-260 (2011). Poca, M. -A., Sahuquillo, J., Arribas, M., Báguena, M., Amorós, S., Rubio, E. Fiberoptic intraparenchymal brain pressure monitoring with the Camino V420 monitor: reflections on our experience in 163 severely head-injured patients. Journal of Neurotrauma. 19, (4), 439-448 (2002). Koskinen, L. -O. D., Grayson, D., Olivecrona, M. The complications and the position of the Codman MicroSensorTM ICP device: an analysis of 549 patients and 650 Sensors. Acta Neurochirurgica. 155, (11), 2141-2148 (2013). Badri, S., et al. Mortality and long-term functional outcome associated with intracranial pressure after traumatic brain injury. Intensive Care Medicine. 38, (11), 1800-1809 (2012). Yuan, Q., et al. Impact of intracranial pressure monitoring on mortality in patients with traumatic brain injury: a systematic review and meta-analysis. Journal of Neurosurgery. 122, (3), 574-587 (2015). Shen, L., et al. Effects of Intracranial Pressure Monitoring on Mortality in Patients with Severe Traumatic Brain Injury: A Meta-Analysis. PloS One. 11, (12), e0168901 (2016). Chesnut, R. M., et al. A trial of intracranial-pressure monitoring in traumatic brain injury. The New England Journal of Medicine. 367, (26), 2471-2481 (2012). Aries, M. J. H., et al. Continuous determination of optimal cerebral perfusion pressure in traumatic brain injury. Critical Care Medicine. 40, (8), 2456-2463 (2012). Vespa, P., et al. Metabolic crisis occurs with seizures and periodic discharges after brain trauma. Annals of Neurology. 79, (4), 579-590 (2016). Hartings, J. A., et al. Spreading depolarisations and outcome after traumatic brain injury: a prospective observational study. The Lancet. Neurology. 10, (12), 1058-1064 (2011). Okonkwo, D. O., et al. Brain Oxygen Optimization in Severe Traumatic Brain Injury Phase-II: A Phase II Randomized Trial. Critical Care Medicine. 45, (11), 1907-1914 (2017). Foreman, B., Ngwenya, L. B., Stoddard, E., Hinzman, J. M., Andaluz, N., Hartings, J. A. Safety and Reliability of Bedside, Single Burr Hole Technique for Intracranial Multimodality Monitoring in Severe Traumatic Brain Injury. Neurocritical Care. (2018). Stuart, R. M., et al. Intracranial multimodal monitoring for acute brain injury: a single institution review of current practices. Neurocritical Care. 12, (2), 188-198 (2010). Talving, P., et al. Intracranial pressure monitoring in severe head injury: compliance with Brain Trauma Foundation guidelines and effect on outcomes: a prospective study. Journal of Neurosurgery. 119, (5), 1248-1254 (2013). Aiolfi, A., Benjamin, E., Khor, D., Inaba, K., Lam, L., Demetriades, D. Brain Trauma Foundation Guidelines for Intracranial Pressure Monitoring: Compliance and Effect on Outcome. World Journal of Surgery. 41, (6), 1543-1549 (2017). Pinggera, D., Petr, O., Putzer, G., Thomé, C. How I do it/Technical note: Adjustable and Rigid Fixation of Brain Tissue Oxygenation Probe (LICOX) in Neurosurgery - from bench to bedside. World Neurosurgery. 117, 62-64 (2018). Gardner, P. A., Engh, J., Atteberry, D., Moossy, J. J. Hemorrhage rates after external ventricular drain placement. Journal of Neurosurgery. 110, (5), 1021-1025 (2009). Maniker, A. H., Vaynman, A. Y., Karimi, R. J., Sabit, A. O., Holland, B. Hemorrhagic complications of external ventricular drainage. Neurosurgery. 59, (4 Suppl 2), ONS419-424; discussion ONS424-425 (2006). Dreier, J. P., et al. Recording, analysis, and interpretation of spreading depolarizations in neurointensive care: Review and recommendations of the COSBID research group. Journal of Cerebral Blood Flow and Metabolism: Official Journal of the International Society of Cerebral Blood Flow and Metabolism. 37, (5), 1595-1625 (2017).